If anyone has ever been to an Indian Wedding, you know that it lasts for a few days and are full of gorgeous colourful sarees and amazing food! 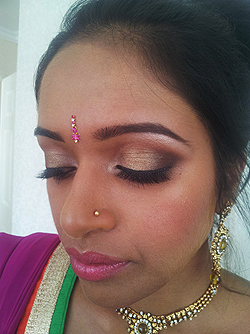 Makeup for Indian weddings is a real love of mine, as the women are so glamorous looking and I get to do a range of looks according to the theme and clothing for each ceremony. Eye and lip colours can range from oranges and pinks to warm golds and rich browns. I was privileged to be sent by M.A.C over to the Indian IIfa awards in Macau China, which is like the Bollywood Grammys. As artists, M.A.C gave us master classes to master doing beautiful flawless looks on the Indian skin tone. 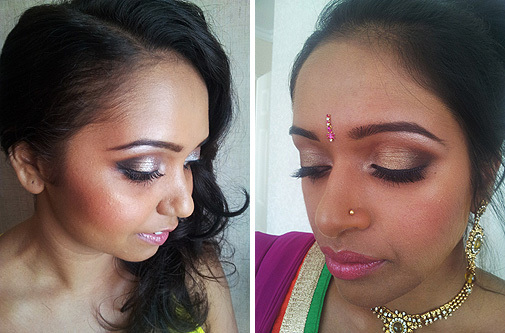 Ever since this experience, I just love doing makeup for Indian Weddings! Making the skin look flawless and matching the skin tone perfectly is my first priority as there are many makeup artists who make the darker skin tones appear too light and ashy looking or too dark and orange looking. I have a lot of experience in colour correcting the skin, so that it looks even. Here are a couple of beautiful Indian brides that i have been privileged to do in the last few weeks. If you would like to have the most beautiful flawless look on your wedding day, make sure you contact me, as i would love to do your makeup. Previous Previous post: Have A Corporate Event Coming Up? Look Your Best! Next Next post: Which Makeup Will I Be Using When Doing Your Makeup?